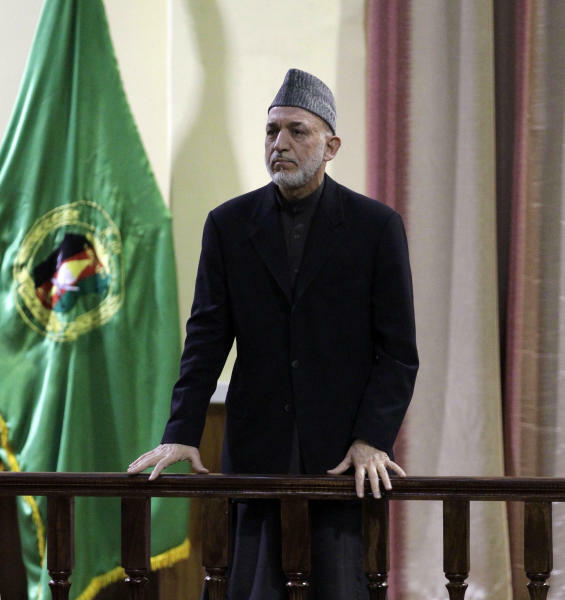 KABUL, Afghanistan (AP) — Afghan President Hamid Karzai said Saturday that he will issue a decree banning Afghan security forces from asking international troops to carry out airstrikes under "any circumstances." The announcement came amid anger over a joint Afghan-NATO operation this week that Afghan officials said killed 10 civilians, including women and children, in northeast Kunar province. 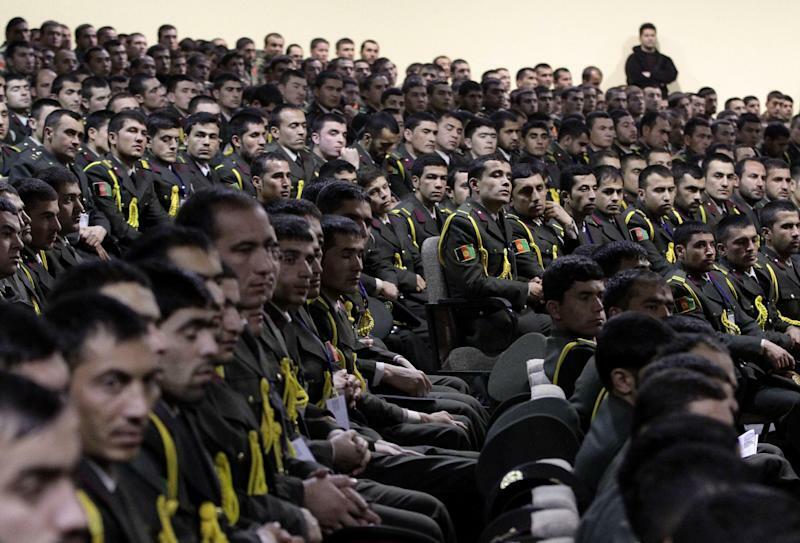 "I will issue a decree tomorrow that no Afghan security forces, in any circumstances, in any circumstances can ask for the foreigners' planes for carrying out operations on our homes and villages," Karzai said in a speech at the Afghan National Military Academy in Kabul. Civilian deaths at the hands of foreign forces, in particular airstrikes, have been among the most divisive issues of the 11-year-old war, although the U.S.-led coalition has implemented measures to mitigate them. But the Afghan military also relies heavily on air support to gain advantage in the fight against Taliban militants and other insurgents. Many have expressed concern that the impending withdrawal of international combat forces by the end of 2014 will deprive government security forces of that crucial weapon. President Barack Obama has announced that he will withdraw about half of the 66,000 U.S. troops in Afghanistan within a year. According to Gen. John Allen, the former top commander of U.S. and NATO forces in Afghanistan, the coalition can provide air support to troops on the ground anywhere in Afghanistan within 12 minutes of a request. He said Afghan forces would have to get used to not having the same abilities in the future. Jamie Graybeal, a spokesman for the U.S.-led coalition, declined to comment on Karzai's remarks because alliance officials have not yet seen the decree. Karzai said Allen's successor, U.S. Gen. Joseph Dunford, told him that Afghanistan's intelligence agency, the National Directorate of Security, had requested the airstrike late Tuesday in Kunar's Shigal district, which borders Pakistan. When Dunford met with Karzai two days later, the coalition said the general expressed "his personal condolences for any civilians who may have died or been injured as a result of the operation" and said investigators were trying to assess what happened. Karzai said Afghan forces were ready to take over their own security despite concerns about persistent violence that have cast doubt on their capabilities. "We are happy that foreign forces are withdrawing from our country," he said. "We are happy for all their help and assistance so far, but we don't need foreign forces to defend our country. We want our Afghan forces to defend their homeland." However, former Afghan Gen. Amrullah Aman was surprised by the remarks, saying international air power is essential since one of Afghanistan's main weaknesses in defending itself is the lack of a fully developed air force. "In a country like Afghanistan where you don't have heavy artillery and you don't have air forces to support soldiers on the ground, how will it be possible to defeat an enemy that knows the area well and can hide anywhere?" he asked. "There must be air support to help all those ground forces on the battlefield." The U.N. has said the number of civilian deaths and injuries attributed to foreign and Afghan forces, including airstrikes, has declined as both groups strengthened policies to protect civilians, but it also expressed concern there could be an uptick as the summer fighting season approaches. Local Afghan officials claim five boys, four women and one man were killed in the bombardment. Four insurgents also were reported killed, but Karzai said that did not justify the loss of so many civilian lives. He said the public had complained not only about foreign forces but about Afghans as well. 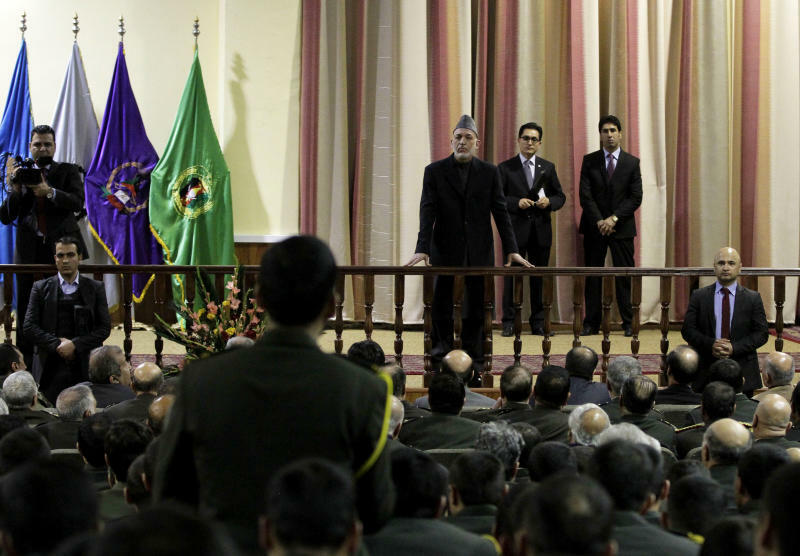 'The people must not be afraid of you," Karzai told the military audience. "They must feel safe when they see you in their areas and villages." Associated Press writer Kim Gamel in Kabul contributed to this report.